Good Old Games is hosting a big sale this weekend, offering massive discounts on select adventure titles. If you aren't familiar with Good Old Games, well, you really should be. The site is similar to Valve's Steam service, in that both exist to distribute software over the 'net, but where Good Old Games differentiates itself is in its focus: GOG deals almost exclusively in classic titles that are largely unavailable in our modern era. Not only does the site sell these games, its developers also often recode certain sections of these older titles so that they can be played on modern operating systems. In short, GOG is doing the work of the angels. As if that wasn't reason enough to appreciate the service, it also runs deals that are often amazingly attractive. To wit: This weekend GOG is offering a number of titles from Telltale Games at an 85-percent discount. The good news? Back To The Future: The Game can be yours for only $3.74. 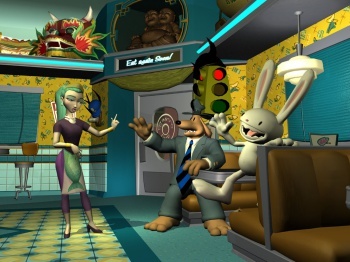 Sam & Max Save The World and Sam & Max Beyond Time are each $4.49. Tales of Monkey Island is only $5.24, and that same price can be found on Sam & Max: The Devil's Playhouse. Or, if all of these are still too spendy, you can pick up Wallace & Gromit's Grand Adventures for only $2.99. Of course, that does leave a pretty sizable piece of bad news: Telltale's best game to date is, without a doubt, its adventure game adaptation of Robert Kirkman's The Walking Dead. Unfortunately, that title is not a part of this weekend's sale, nor is Telltale's Jurassic Park adaptation. Those omissions aside, this is still a very good weekend to enjoy a few adventure games. You can find full details on GOG's promotional page, along with a handy countdown ticking away the seconds until the offer comes to a close. While there, be sure to register for a GOG account, as even if you don't find yourself attracted to any of these titles, the firm runs promos like this with increasing regularity, and if you've signed up for a free account there, you'll receive an email whenever GOG opts to slash prices on its wares.